The summer of 2013 welcomes the 2nd annual Gustavus Summer Music Strings Institute opens its doors July 16 – 22 in the Schaefer Fine Arts Center. Information and registration for this 6-day, intensive string study institute, led by Dr. Justin Knoepfel and other members of the Gustavus Department of Music, is available online at www.gustavus.edu/camps/stringinstitute. The Gustavus Summer Strings Institute has been developed with talented high school string players in mind. Musicians in high school in the fall will experience an intense musical program which focuses on the individual student while providing orchestral and solo performance opportunities. The Institute is a place to grow musically and personally while discovering what it means to play great music in a short time. It will provide one-on-one instruction with dedicated and gifted faculty, practice partners with current Gustavus student musicians, performance opportunities, and instruction in music theory and ear training. Highlights during the week include five days of rigorous rehearsal and practice, side-by-side rehearsals with faculty during orchestra, a solo performance by every student attending, the establishment of effective practice habits through individual daily instruction, and understanding the role of music in a liberal arts college setting. 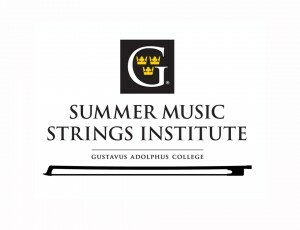 Registration for the Gustavus Summer Music Strings Institute is available online at www.gustavus.edu/camps/stringinstitute or by contacting Dr. Justin Knoepfel. jkoepfe@gustavus.edu or 507-933-7360.